The new site of SQLPort is finally live. This is not just a redesign of the original site, published in April 2010. This is the start of the second approach that we shall start implementing right from the very next meeting, the 91th SQLPort meeting to be held on the 21st of February. Do not expect a huge number of things to change right away, but more steadily with every event through the year we shall be changing a lot of things… On purpose I am not going to dive into the details of what is coming and how the change will be implemented, because this process is first to be revealed to the SQLPort members. 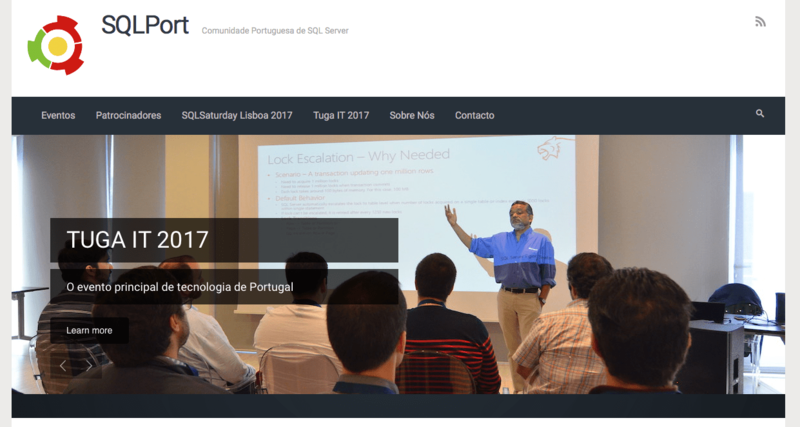 SQLPort is one of the oldest user groups in Portugal (approaching 7 years in just 3 months) and let me claim that we are also one of the most successful ones. Besides doing ever successful meetings in Lisbon every single month (in August as well), we have launched Microsoft Data Platform Community in Oporto that became an incredible successful Porto.Data community, we did meetings in Coimbra & Aveiro, we have organised 1 major international event per year (SQLSaturday) and last year, together with many great communities and leaders we have lead the organisation of the Tuga IT. For many years we have focused on building and implementing international events, and this year more focus will be given to the user group itself.